I’m busy, busy knitting these days but I did promise some pics of FOs when they were done. First: the Snapdragon Tam for my kids’ German Teacher, which was well received. I absolutely loved knitting this pattern. And it flew up. I cast-on really late last Sunday night (more like early Monday morning, to be honest!). It was finished and blocking by Wednesday; ready to be gifted at the last German lesson on Thursday afternoon. I loved working in Malabrigo Sock too. I made this with 4mm needles, which I felt was a little loose for me. Next time, I make this – and I’m certain there will be a next time – I’ll make the next size up, in a smaller size needle. I’m not absolutely convinced by the sudden flashes of lighter colour – I would have rathered if it had less of the yellow-green. But hopefully it doesn’t take from the overall effect. The German Teacher told me she loved it and that it was her favourite colour. So I’m happy! This pattern, Smith, also comes from Ysolda Teague’s book “Whimsical Little Knits 2”. I loved knitting this – attaching the various rows of stripes was such fun. I modified the centre portion by omitting the central repeat. I did it because I knew I wouldn’t have enough yarn if I followed the pattern as written. Now that it’s done, I think that including the repeated section would have made the overall body too elongated. This was also a quick knit – though it stalled for a bit while I searched for what to use for stuffing. Going on a tip from fellow knitters Sinead (@sineadR) and Mairead (@doogarry), I bought cheap pillows in Pennies – two for €4!! They’re filled with perfect stuffing material and such a bargain too – can’t wait to make more soft toys, all of a sudden! The yarn was “rescue skein” I re-homed when Clarabel was de-stashing recently. It’s a thick-n-thin cotton from Araucnia Yarns “N. Cotton PT 709” if that makes any sense to anyone? I’m still knitting like the clappers, however: two gifts down, three to go… Not to mention GlenvarAgin – did someone mention GlenvarAgin? No! Perish the thought! Shudder! Being a knitting-mother of school-going kids I believe I am honour-bound to produce a knitted item as presents for their teachers. It’s a duty I take very seriously but, over the past two years, what should be an opportunity to create a unique present – that is appreciated and cherished for its one-off exclusivity – becomes yet another lesson in hubris for me as the resulting item is (more-than-likely) greeted with quizzical look or received with forbearance. This year, because I now have two children going to school, it should mean I’ve twice the “fun” in store. In fact, I have high hopes that I will succeed this year. Not only do I expect I will produce gifts that the recipients will like, but I won’t be stressed out of my head about how long it is taking me to make them. Or… I’ve yet another module of “Hubris and How It Builds Character” to complete a practical exam for my Life-studies course at the University of Life. So why am I starting out feeling so confident? Why should this year be any different? I’ve never knitted a tea-cozy before and it’s something I’ve wanted to do but needed an excuse to get on with. For Bonus-Points, I realised that I can dust down a WIP I started in a bout of Startitis earlier in the year: Calyx Hat by Debbie New in Noro Big Kureyon. If I judiciously omit to sew up the seams – at the right places – hey, presto: my hat’s a tea-cozy. Then, I showed DS my copy of Whimsical Little Knits 2, by Ysolda Teague. 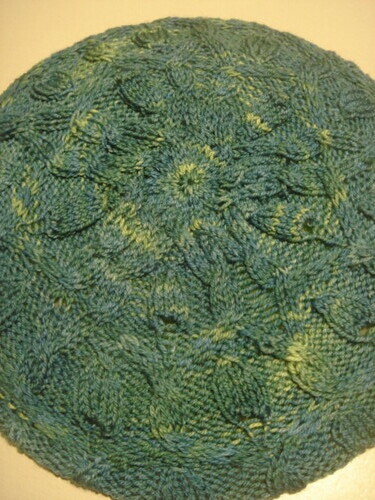 I was thinking Snapdragon Tam or Scoll Lace Scarf. 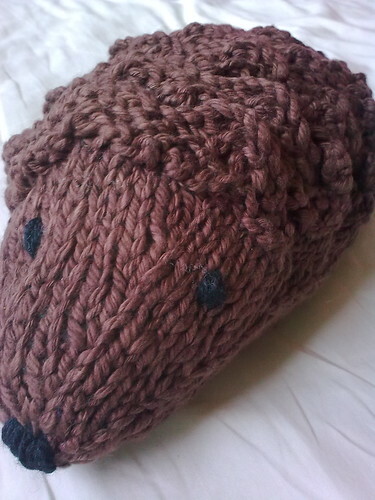 I should have guessed: naturally, he picked out Smith – the Hedgehog pattern – for me to make for his teacher. I’ve been wanting to make this pattern for a while. 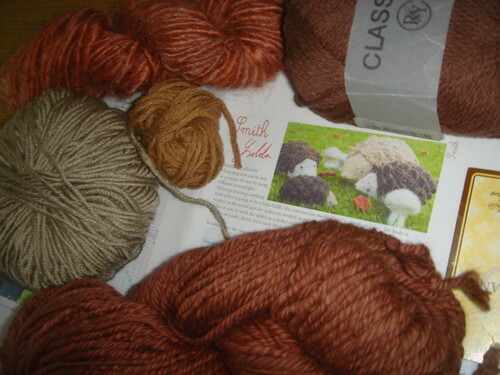 I’m on Double-Bonus Points because- surprisingly – I have brown yarn! What’s more, this pattern will teach me a new cast-on: Triple-Bonus-Points!!! So, sorry Ms Daly, if you weren’t expecting to get a stuffed hedgehog this year; but this knitter is hoping for Kudos not Hubris, this time!